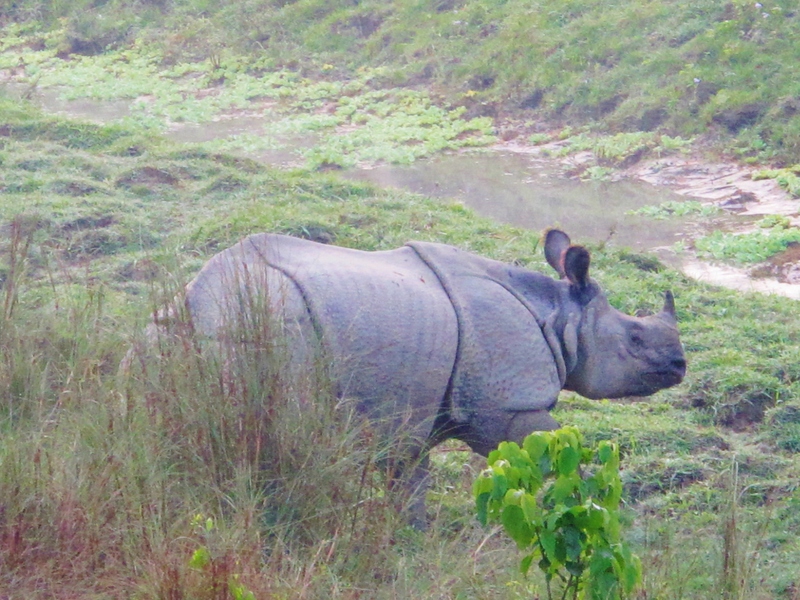 Indian Rhinoceros – this individual, an adult male, emerged from the national park every evening to bathe in the river at the edge of Sauraha village. 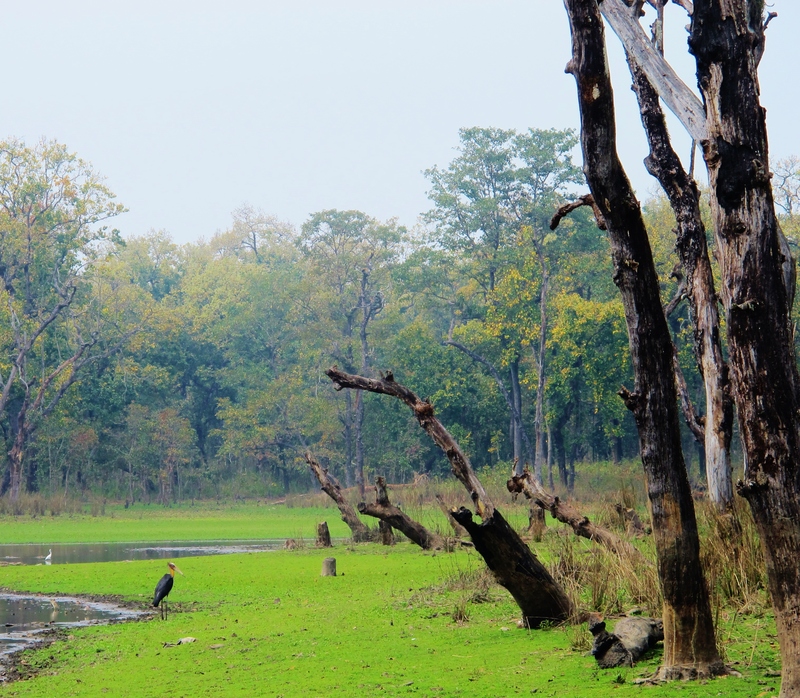 I decided to start gently in Nepal with a few days in Chitwan National Park. This huge area, Nepal’s oldest national park, is in the south of Nepal bordering India, about 5 hours by bus from Kathmandu. It is a stronghold for the rare Indian Rhinoceros, as well as Tiger – both of which are regularly seen here. I was lucky as, during my visit, an adult male Rhinoceros was in the habit of bathing in the river next to Sauraha village in the late afternoon. I was told he went into the village at night to eat crops and generally make a nuisance of himself. In any case, I saw him every afternoon, and didn’t seem too bothered by the large numbers of people taking his photo. I decided to stay outside the park proper during my stay, and visit the “buffer zones” only. The reasoning behind this was mainly financial – it was quite expensive to go into the park as, in addition to the $15 per day entry fee, it would have been compulsory for me to hire not one but TWO guides (for my own safety – sloth bears and rhinos can be dangerous, and there are plenty of tigers). Also, the best birding areas are quite deep inside the park, meaning renting a jeep is the best option for birders – but this was well out of my price range. So I focused on the areas around Sauraha village, alongside the river, and a nearby forested buffer zone called “20,000 Lakes”, which was about a 30-minute cycle ride from my accommodation (bicycle rental is cheap and readily available in Sauraha). All in all, I saw 107 bird species in one evening and two full days – a nice start to my birding in Nepal. Distant Lesser Adjutant at one of the “20,000 Lakes” – this pond also had Red-naped Ibis and Black Stork. I had the good fortune to make several birding acquaintances during my stay. The first was “Basu”, president of the local bird society and a specialist bird tour guide. Although I didn’t hire him, he kindly took me on an afternoon walk to a restricted area to see roosting owls – we saw a pair of Brown Hawk Owls and Jungle Owlet. Basu is extremely knowledgeable about the local birds (he has seen more than 95% of the 627 bird species recorded at Chitwan), and very easy company – I would recommend him for anyone looking to hire a guide. The second encounter was slightly more surreal. Birding at the 20,000 Lakes one morning, a car pulled up and out stepped Carol Inskipp, accompanied by three Nepalese birders. Carol is something of a legend among birders in South Asia, having authored most leading bird field guides to the area, and had some very useful advice for me about birding in Nepal. My morning got even better when I bumped into them again a few hours later, when they had just found a very showy Nepal Wren-Babbler – the first record for Chitwan of this Nepalese near-endemic bird. A most unexpected lifer for me at Chitwan, and seen in such illustrious company as well. 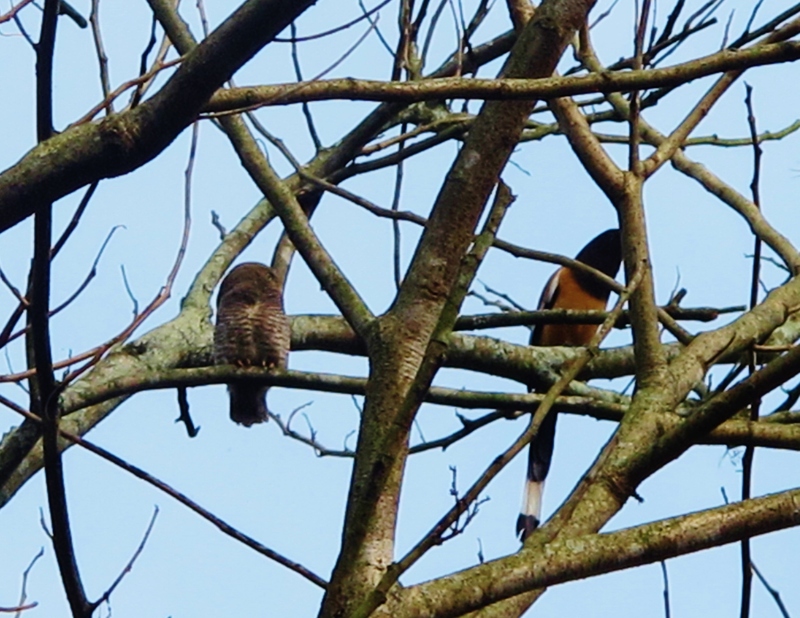 Jungle Owlet and Rufous Treepie – these two were certainly not the best of friends! Lifers: Yellow-footed Green Pigeon, Jungle Myna, White-browed Wagtail, Ashy-headed Green Pigeon, Indian Pond Heron, Brown Crake, Red-naped Ibis, Indian Peafowl, Smoky Warbler, Rosy Pipit, Jungle Babbler, Common Hawk-Cuckoo, Plum-headed Parakeet, Chestnut-bellied Nuthatch, Nepal Wren-Babbler, Jungle Owlet, Fulvous-breasted Woodpecker, Himalayan Flameback (total 1,836). 2015 Year Ticks: Woolly-necked Stork, Common Merganser, Lesser Adjutant, Rose-ringed Parakeet, Eurasian Collared Dove, Citrine Wagtail, River Lapwing, Orange-breasted Green Pigeon, Stork-billed Kingfisher, Booted Eagle, Lesser Yellownape, Grey-headed Fish Eagle, Black Stork, Common Woodshrike, Brown Hawk Owl, Silver-backed Needletail (total 512). 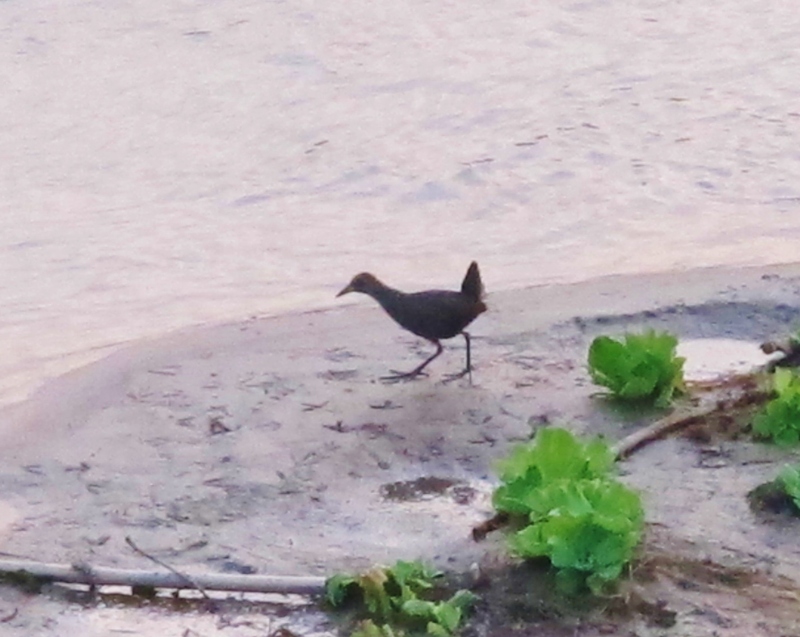 Brown Crake out in the open … this speciality of the area was surprisingly easy to see – for a crake. 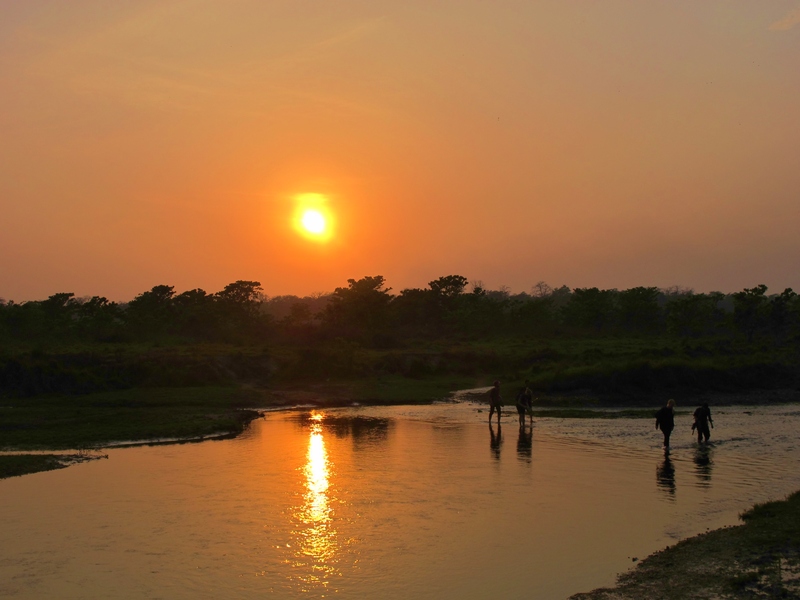 Trekkers returning from the national park at sunset.